The QNAP TVS-1282 12-Bay NAS Enclosure lets you build a centralized storage solution that shares files and streams videos to all your connected devices. The TVS-1282 holds larger-capacity 2.5"/3.5" hard drives in eight SATA III bays and supports faster SSDs in four 2.5" SATA III bays. Additionally, it can house up to two M.2 SATA III SSDs, which can be used for caching data. To manage the data and QTS operating system, it is powered by a 3.4 GHz Intel Core i7-6700 Quad-Core processor along with 64GB of 2133 MHz DDR4 memory. Moreover, it sports a 450W power supply for meeting the requirements of a graphics card. QTS lets you configure your drives in a RAID array, such as RAID 0, 1, 5, 6, 10, + Hot Spare, and JBOD, and also provides additional storage options that might not be available on other storage units. You can activate the Tiered Storage feature, which continuously optimizes storage efficiency across M.2 SSDs, 2.5" SSDs, and SATA-based hard drives, or create multiple storage pools that utilize different types of storage drives. With Application-based Partitioning, it automatically runs demanding apps on your faster SSDs and stores less-frequently accessed files on larger-capacity hard drives. In addition, the M.2 SSDs can be configured to the boost the performance of the overall file access system. QNAP has outfitted this enclosure with three HMDI ports and five USB 3.0 ports so you can use it as a standalone system. It delivers 4K visuals utilizing integrated Intel HD Graphics or an optional graphics card installed in one of the three PCIe 3.0 slots. You may also equip the TVS-1282 with PCIe NVMe SSDs, 10GbE/40GbE NICs, and USB 3.1 expansion cards to these slots. For powering your drives and PCIe cards, it comes built with a 450W PSU. To cool your components, three 80mm fans are on board. Moreover, data is quickly delivered to connected systems via four Gigabit Ethernet ports. QNAP's TVS-1282 12-Bay NAS Enclosure operates using 100-240V at 50-60 Hz and includes four Ethernet cables, a power cord, 2 x M.2 screws, 2 x M.2 bolts, 24 x flathead screws for 2.5" drives, 2 x M.2 SSD heatsinks, and an IR remote control. Protection is provided by a limited two-year warranty. Graphics cards are optimized for graphical calculations and transformations and require more power compared to other hardware. The TVS-1282 offers a 450W power supply that is capable of powering an optional AMD Radeon R9 Series graphics card for smooth GPU passthough to virtual machines. The TVS-1282 is powered by a 3.4 GHz 6th-Generation Intel i7-6700 Quad-Core processor, increasing system performance by 20 to 30% when compared with previous generations. It enhances the efficiency of CPU-demanding applications such as virtualization, real-time 4K video playback, and serving large numbers of simultaneous connections. The TVS-1282 features two M.2 slots designed for caching to increase IOPS performance, transfer speed, and reliability. SSD cache boosts overall system performance and is suitable for improving overall workflow of random IOPS demanding applications such as virtualization. The TVS-1282 combines M.2 SSD, 2.5" SSD, and 3.5" HDD in one box to effectively realize tiered storage for increasing application performance and lower TCO of storage at the same time. 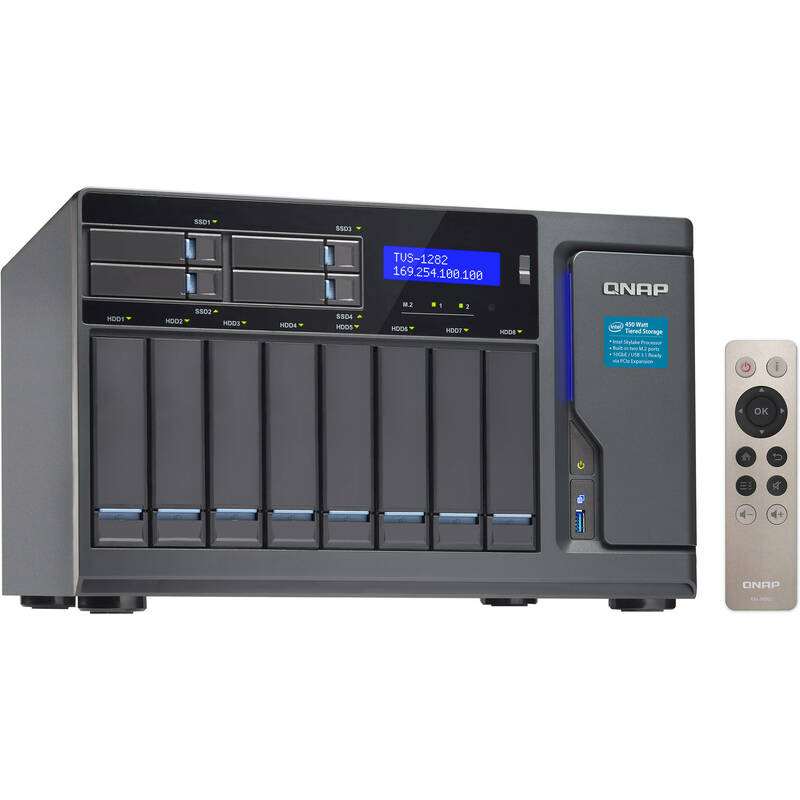 QNAP's Qtier Technology empowers the TVS-1282 with Auto Tiering that continuously optimizes the storage pool utilizing PCIe NVMe SSD, M.2 SSDs, 2.5" SSDs, and SATA-based drives. With Auto Tiering, the TVS-1282 automatically moves frequently-used "hot" data to high-performance storage tiers and less-accessed "cold" data to lower-cost, higher-capacity drives. Businesses will no longer have to invest in expensive flash technology, but still enjoy improved application performance and cost efficiency from Auto Tiering. Every application requires different performance such as Surveillance Station that requires higher-priority access to storage to ensure the integrity of recordings, while normal transmission speeds are sufficient for file sharing. However, when multiple applications are running on the same storage media, the required throughput level cannot be guaranteed as the storage media is busy handling I/O requests from all of them. The TVS-1282 supports three different types of storage media: M.2, SSD, and SATA hard drive, and they can be configured as independent partitions for different applications, ensuring a sufficient throughput level for every application. With four Gigabit Ethernet ports, the TVS-1282 allows applications to use dedicated interfaces to meet network traffic distribution requirements. Network interfaces can be managed with the Network & Virtual Switch app, which enables optimized network resources for the TVS-1282, virtual machines, and containerized apps. The TVS-1282 features three HDMI ports, including one HDMI 2.0 port for smoothly playing Ultra HD 4K (4096 x 2304) videos. You can connect the TVS-1282 to a TV or A/V receiver and use a Kodi media player and a QNAP remote control to enjoy rich media content and 4K 60 fps videos. Featuring Intel HD Graphics, the TVS-1282 delivers real-time 4K (H.264) and 1080p video transcoding, which converts videos to universal formats that can be smoothly played on PCs, mobile devices, and Smart TVs. The TVS-1282 comes with three HDMI outputs that can support three monitors in either "duplicated" or "extended" desktop configuration. Duplicating will display the same content on every display, and extended desktop mode allows users to display applications across the displays for improved multitasking convenience and productivity. When displaying content using HDMI, you can use the TVS-1282 as a multimedia player by using HD Station. Alternatively, you can choose to output the Linux operating system desktop to use the TVS-1282 as a PC. The TVS-1282 supports online capacity expansion by connecting multiple high-performance SAS-enabled QNAP RAID expansion enclosures or economical USB 3.0 expansion units to meet the needs of growing business data. The total storage capacity of the TVS-1282 can be gradually expanded and easily managed by the QTS Storage Manager, being useful for large data applications such as video surveillance, data archiving, TV broadcast storage, and more. QNAP VJBOD (Virtual JBOD) is network-based JBOD, allowing you to expand storage of your QNAP NAS with multiple QNAP NAS units. You can mount iSCSI LUNs from a QNAP NAS to the TVS-1282 as local disks and create virtual storage pools and volumes for operating NAS functionalities such as creating and reverting snapshots and indexing multimedia files into the media library. With VJBOD, you can centrally utilize the storage space from multiple QNAP NAS units and manage it with the interface on the local NAS. VJBOD supports 10GbE/40GbE Ethernet connection interfaces and port trunking (link aggregation with multiple LAN ports) that increases the performance and reliability of your VJBOD storage. The intuitive QTS features a modern flat design to streamline loading times. It provides an intelligent desktop that allows you to find desired functions quickly, monitor important system information on a real-time basis, and open multiple application windows to run multiple tasks concurrently, bringing operating efficiency. QRM+ is QNAP's Centralized Remote Server Management solution designed for IT teams. It provides a web-based solution—accessible from any web browser—to discover, map, monitor, and manage all of the critical computing devices on the network such as servers, PCs, embedded PCs, and thin clients from a single-point. Supporting IPMI 1.5 and 2.0, QRM+ provides remote KVM (Keyboard, Video, Mouse) for certain IPMI devices and supports tracking every action using KVM recording and playback. With centralized management by QRM+, IT infrastructure and device security are enhanced while troubleshooting & network resource performance analysis is simplified. QmailAgent is an online email client that helps you manage multiple email accounts, allowing you to access all of your emails and to easily switch between different accounts. It provides complete functionality for composing, reading, and organizing emails. You can even attach files, photos, and documents from the TVS-1282 when composing emails. Qmail also allows iOS and Android users to quickly check multiple email accounts with mobile devices and to browse & send emails using the QmailAgent on their TVS-1282. Virtualization Station allows you to host virtual machines (VM) on the TVS-1282 and access them via a web browser or VNC. Virtualization Station supports multiple operating systems, fast VM creation, VM backup & restoration, VM import/export, snapshot, and Device Management for centrally managing VMs. It lets the TVS-1282 and VMs to share the same LAN port. No longer constrained by physical network performance, high-speed virtual switches increase the data transfer between VMs as well as between VMs and NAS through the internal interface. An optional AMD Radeon R7/ R9 Series graphics card can also be installed into the TVS-1282's PCIe slot for GPU passthrough to virtual machines, boosting the computational and rendering power of virtualized applications. The TVS-1282 also features Container Station, which integrates LXC and Docker lightweight virtualization technologies. You can operate multiple isolated Linux systems on the TVS-1282 as well as download apps from the built-in Docker Hub Registry. As an iSCSI/IP-SAN storage solution, the TVS-1282 supports VMware, Citrix, Microsoft Hyper-V, and Windows Server 2012 R2, benefiting flexible deployment and management in virtualization environments. The TVS-1282 supports VMware VAAI and Microsoft ODX to increase performance by offloading server loading for ESXi server and Hyper-V respectively. It is compatible with a QNAP vSphere Client plug-in and QNAP SMI-S provider with enhanced efficiency of operations and management in virtualization applications. QNAP's QvPC Technology allows you to operate the TVS-1282 as a PC by plugging in a keyboard, mouse, and HDMI display. You can directly access stored data, run multiple applications using Windows, Linux, UNIX, Android-based VMs with the Virtualization Station, surf the web, enjoy 4K or 1080p videos with up to 7.1 channel audio with Kodi, monitor surveillance live feeds with local display, and more. QNAP's full NAS encryption by volume-based technology ensures data security by encrypting all of the files stored in the default shared folders on the TVS-1282. Besides AES 256-bit encryption for both volumes and shared folders, the TVS-1282 also provides numerous security options such as encrypted access, IP blocking, 2-step verification, and more. The TVS-1282 offers flexible backup solutions for Windows and Mac users, Volume/LUN snapshots (up to 256 snapshots per volume or LUN, and maximum 1,024 snapshots per NAS), Snapshot Replica and Clone, and disaster recovery solutions including RTRR, rsync, and cloud storage backup. Qsync provides multiple ways of file synchronization and group file sharing, enhancing the flexibility of collaboration. Any file uploaded to the TVS-1282 will be made available for all linked devices such as computers, laptops, or mobile devices. Qsync is especially useful for frequent travelers to manage files and always have the most up-to-date files on different devices. Surveillance Station is a network surveillance Video Management System (VMS) that offers a user-friendly management interface, over 3,000 compatible IP camera models, and expandable IP camera channel licenses. It supports real-time monitoring and video & audio recording and playback with a wide range of customizable settings. You can also install the Vmobile app on your mobile devices to manage monitored channels anytime and anywhere to safeguard your office environment or install the Vcam mobile app to turn your device into a network camera, which instantly records to your TVS-1282. It includes 8 free IP camera channels, and you can expand up to 40 channels by purchasing additional licenses. The built-in App Center provides over 100 apps including tools for backup/sync, business, content management, communications, downloading, entertainment, and more. You can freely install apps as needed to expand the TVS-1282's functionality. Box Dimensions (LxWxH) 18.25 x 17.5 x 14.5"